Last week we were on the water almost every day with clients and friends Cameron Lester and Paul Broddick as well as Trent. 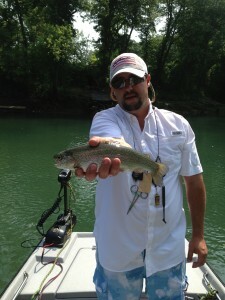 The weather and the water have been just beautiful and the fly fishing has just been off the charts. 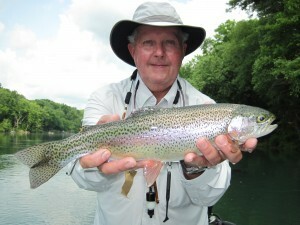 Bo can’t remember the last time we caught so many really good quality Rainbows. 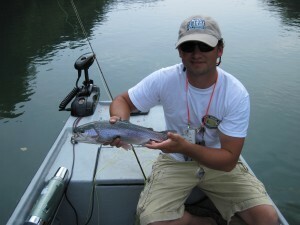 The fly almost does not seem to matter, just get a good drag free drift and the fish take it. We have had some really good windows of water to fish but it looks like until July 4th they are likely to run quite a bit of water in order to get Greers Ferry Lake back down to the conservation pool for the long holiday weekend. After that we should again have less generation and some great river conditions so get your fly fishing trip booked before Bo and his son, Trent, head for Canada and Atlantic Salmon the middle of July.